Like many school districts, Lindsay Unified School District faced difficulty meeting the needs of increasingly diverse student populations. 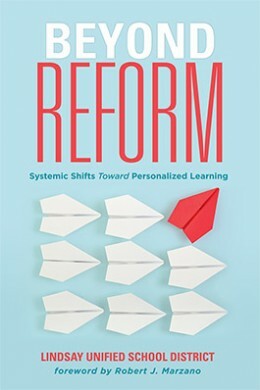 Through this detailed resource, you will learn how Lindsay Unified took action to improve student learning by shifting from a traditional time-based education system to a learner-centered performance-based system. By adopting and tailoring Lindsay Unified’s instructional model, you and your team can embark on your own district’s transformation. Consider Lindsay Unified’s core values and visions for leadership, curriculum, assessment, learning, and technology. Meet Lindsay Unified students and see how the district’s performance-based system transformed their learning. Explore core value rubrics that school staff can use to reflect on personal leadership growth, frame important conversations, and provide feedback. Study Lindsay Unified’s instructional model, which helps align the district’s instructional decisions with its unified instructional vision. Download a free reproducible checklist for shifting to a performance-based system and lists of recommended strategies for ensuring a successful district transformation.